I had this written and ready to go yesterday evening, but WordPress suffered a glitch and wouldn’t let me post or save anything. The good guys at behind the scenes got it fixed promptly, however, and hopefully there won’t be any further hiccups! It had been my original intention to make the post about our CBC as just a single entry, but I found when I got home and started going through my photos, and thinking about what I wanted to say, there was just too much to cram into a single post. Yesterday I talked about the history and purpose of the CBC; today I’ll elaborate on the results of our own outing. Generally CBCs are quiet affairs, at least compared to summer surveys. In the summer a survey of an area that large could easily turn up 70 or 80 species, or even more if you’re in an area of diverse habitats. In the winter, at least here in the northeast, you’ll be lucky to get a few dozen with a good bit of hunting and the whole day at your disposal. We didn’t have the whole day, and the frigid temperatures meant we weren’t really into hunting, so we took what we could get. This is one of the pitfalls of the CBC, that there is no rigorous sampling method so effort varies from year to year according to the number of people available and how many hours they’re able to put in. Weather also plays a factor – the day is selected randomly in advance, usually for a weekend, and the count goes ahead rain or shine. A year with excellent weather is probably going to produce more birds than a year with heavy precipitation, for instance. These variables are all recorded so that they can be factored in in future analyses, and generally for monitoring surveys like this the data are looked at with a wider lens rather than on a year-by-year basis. Because we only had a few hours available to us before the snow started falling and the roads got cruddy, and because we limited the amount of walking we did outside because the cold and wind could peel the skin from your cheeks if you stayed out too long, we had a small list, with just 16 species. Some of the species that were included on the list were star additions that we were pleased to see, though nothing exceptionally rare. Most, though, were common birds. 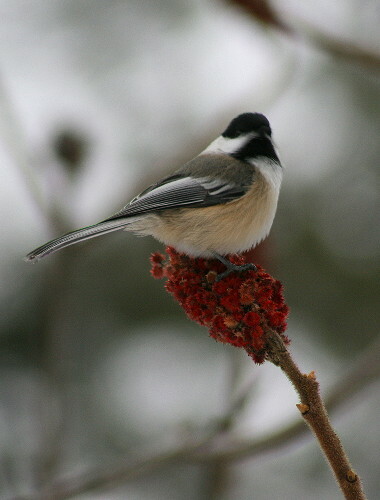 Black-capped Chickadees were, unsurprisingly, the most common with 54 individuals counted. Part of this was because we made a few stops near bird feeders, which always draw in a crowd. But they’re also the most frequently encountered species in the winter woods, especially in evergreen stands. Evergreens, because they’re good cover, often have birds in them, compared to deciduous woods or open fields that are more often than not empty, so we made a disproportionate number of stops in coniferous patches. 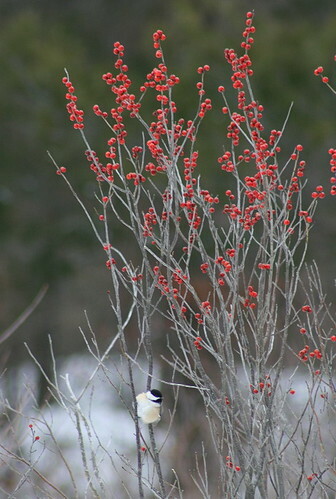 The above individual was part of a flock that were moving through a stand of young pines, bordering an open wetland filled with winterberry bushes sporting their bright orange berries. We also had many of the usual suspects: Blue Jay, Hairy and Downy Woodpeckers, Red- and White-breasted Nuthatches, crow and raven, Red-tailed Hawk, Dark-eyed Junco. In addition to these were some less common though expected species: Brown Creeper, for instance, and Common Redpoll, the latter with 50 counted in three flocks, all flying overhead. We were pleased to find two small flocks of White-winged Crossbill, an irruptive species that is moving south in large numbers this year, being found in many areas south of the border that only get to experience them infrequently. We’ve been hoping to have some come to our feeder this winter, but so far haven’t seen any. 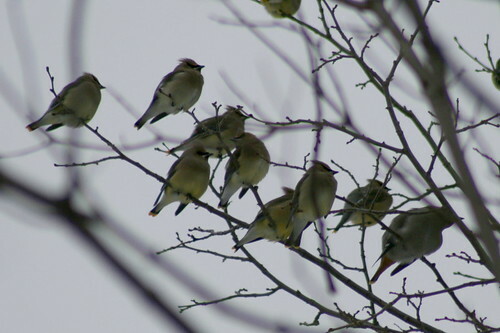 The most exciting birds to find, however, at least in my opinion, was a huge flock of waxwings. Dan discovered them during one of our leapfrog stops. He hustled back to find me (I was finishing up the person 1 segment) and grab his video camera from the car. There was an amazing number of birds in the flock, too many to get a precise count as they joined and departed the main body of birds perched in the tree beside the road. I made a quick estimate by eyeballing groups of fives to figure there were some 80 birds in the flock. 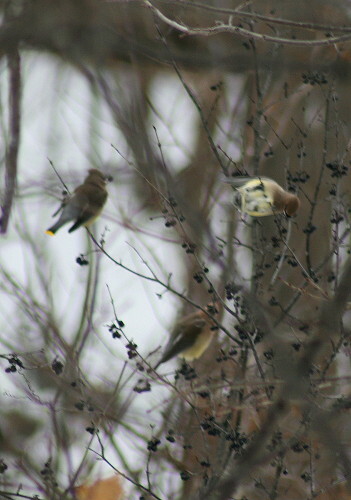 Cedar Waxwings are not a species I see regularly in the winter, so finding such a large group of them was exciting. They seemed to be feeding from buckthorn bushes that were growing between the road and a little patch of wetland. Common Buckthorn (Rhamnus cathartica) is an introduced species that’s become pretty well established through much of northeastern North America. It’s originally from western Eurasia and was brought to the New World as an ornamental garden plant. Though it can be invasive in some habitats, and causes problems for soybean farmers as it is the other plant host in the two-host cycle of soybean aphids, but it’s a great winter food source for birds, who feast on the shrub’s juicy black berries. There is some misconception that because a chemical in the berries actually acts as a laxative in humans, the birds must therefore be unable to obtain sufficient nutrition from the berries and in the long-term could actually suffer or die from a diet composed mostly of them. Of course, that wouldn’t make much sense; shrubs produce berries for the purpose of attracting animals to eat them and thereby spread the seeds. Killing the animal who is spreading your seeds for you would be counterproductive, you’d be out of a courier in no time fast. Similarly, the parent plant “wants” the bird to take the seeds far from the parent plant, so including a laxative is likewise not a great idea. Bootstrap Analysis goes into more detail on the argument. She also points out that they’re a non-native plant so they’re not the top choice for planting in your garden, and provides a list of alternatives. But the fact that they do offer a viable food source for birds in the winter means that even though they’re displacing native plants, it’s not all bad. When the waxwings weren’t feeding on the berries they were perched up in the tree, conserving energy or just digesting, I’m not sure. It was difficult to see the birds in the bushes very well, but the ones in the trees were conveniently out in the open. In scanning the flock, we discovered that about five of the birds were conspicuously different. They were bigger, grayer, and had reddish undertails. 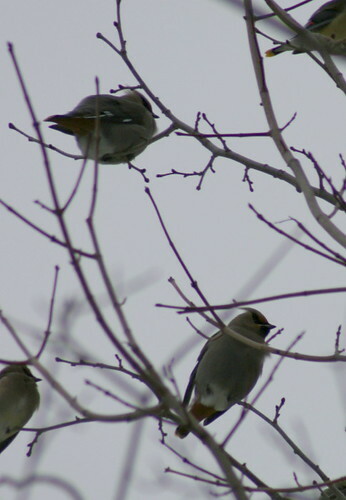 They were Bohemian Waxwings. This was an extremely pleasant surprise; the Winter Finch Forecast by Ontario Field Ornithologists’ Ron Pittaway had predicted this irruptive species to stay north this winter, as it specializes on mountain-ash berries in the colder months and the berry crops up north were good this year. 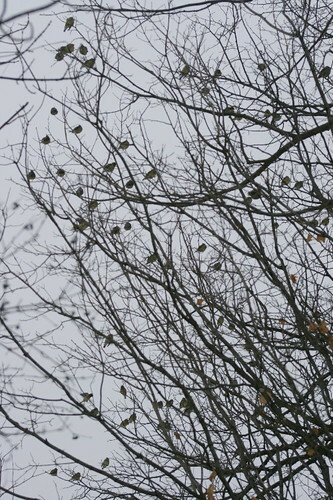 The birds were all perched up near the crown of the deciduous tree they were sitting in, which made it difficult to get good photos as they were not only backlit by the grey sky, but also tucked behind criss-crossing branches. And the photos I did get were all mostly of their undersides, which does highlight their nice rusty undertail coverts, but doesn’t show much of the rest of their plumage, including some fabulous lightning bolts running down the wingtips. These were only the second group of Bohemians that I’ve seen, since they’re an irregular, uncommon irruptive, and tend to move around a lot. I didn’t get great photos of the first group, either. I’ll admit that I’ve never tried super hard to track them down, though. Bohemians breed in extremely small numbers in Ontario, restricted to the Hudson Bay Lowlands up north. The second Ontario Breeding Bird Atlas suggests that they’ve been expanding eastward a bit since the last atlas. Most of the species’ range is further north and west, however, including the northern part of Manitoba, Saskatchewan, and Alberta, up through the territories, over to Alaska, and south through the Rocky Mountains. It could be these were Ontario birds, but they could just as easily have come southeast from the main portion of their range, as they depart the northern part of their breeding range and will wander as far east as Newfoundland looking for winter food sources. Either way, these birds have made a long trip, and it was really nice to get to see them. Nice catch, finding the Bohemian Waxwings! Considering the angle from which I’d be most likely to view one, I’m very happy with your choice of photos to see the comparative field marks between them and the Cedar Waxwings. What a nice surprise, finding those Bohemians! 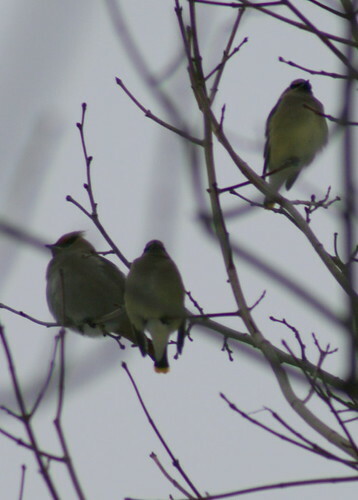 Considering the angle at which I would be most likely to see one, I’m very happy with your shots that so clearly compare the underbelly field marks of the Bohemian Waxwings and The Cedar Waxwings. Amazing how similar your count and ours despite the many kilometres between. Don’t know what your species count was but by the sounds of it, they probably weren’t much different. Bohemians are here virtually every year in Revelstoke but we don’t have the wonderful photos to remember them by. Glad I stumbled upon your blog.